The family of a man who died after an encounter with police in a city about 100 kilometres north of Toronto is demanding the officers involved face charges. About 50 people attended a rally Wednesday in Barrie, Ont., where 32-year-old Olando Brown died after going into medical distress following his arrest by city police last month. Barbara South, Brown's aunt, said her family wants the officers who took him into custody to be held accountable. "We're grieving a lot. He can't be replaced," South said. Brown's death has created more doubt and suspicion in the community about police behaviour, she said. "It just breeds more mistrust that's already there. How do we heal and move along ... when you have to watch your back around somebody that's supposed to be serving and protecting you," she said. Ontario's police watchdog agency, the Special Investigations Unit, has said Brown was arrested around mid-afternoon on June 22, went into medical distress while being booked and died shortly after being taken to hospital. Brown's family shared a video last month that appears to show police using a stun gun on a black man more than once and also appears to show the man being hit by an officer. "He laid down on the ground. He surrendered. What else was he supposed to do?" South said, adding that body cameras on all police officers could help improve accountability. Demands read at the protest by Black Lives Matter on behalf of Brown's family included calls for charges to be laid against officers who were present during Brown's arrest and that their names be released. At the demonstration, Black Lives Matter also asked for the SIU to conclude its investigation within four weeks. They also want confirmation that those officers are off the streets, the City of Barrie to pay for Brown's funeral and counselling for those who have been impacted by his death. Protesters wearing shirts with messages like "Justice 4 Brown" and "Black Lives Matter" held signs that decried alleged police actions during Brown's arrest, accusing them of "panic" and acting "on impulse." Toronto activist and journalist Desmond Cole said he attended the protest to show support for Brown and his family. Cole called the video purporting to show Brown's arrest "deeply upsetting," saying the death of a black person after interactions with police is not a new story and it continues to happen. "We're critical of the structure that keeps reproducing this violence against black people," he said. "We don't want the SIU investigations and the vigils, we want to change the structure of the system so police don't have the ability to be violent," Cole said. "Every single black person I spoke to at the rally today had a story about police brutality," he said. "It's just a constant reminder for black people that we are not safe under the current condition." Cole and BLM also demanded that Premier Doug Ford fully eliminate carding. In January 2017, Ontario changed rules around carding, preventing the practise from being used for "arbitrary police checks." The policy stated that officers must inform people that they have a right not to talk to police or produce identification. "If he has more power to throw more cops on the street, he certainly has the power to remove police officers from our streets," he said. Ford needs to explain how he will stop deaths like Brown's, Cole said. 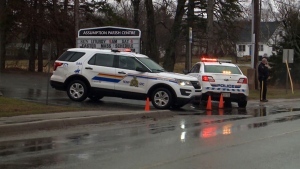 A representative from the Ministry of Community Safety and Correctional Services said in a statement that it will not comment on the case as it's under investigation. Barrie police spokeswoman Const. Sarah Bamford said the police service cannot speak to the demands made Wednesday or about a case where there's an ongoing SIU investigation. The force respects those who protested peacefully Wednesday, Bamford said. 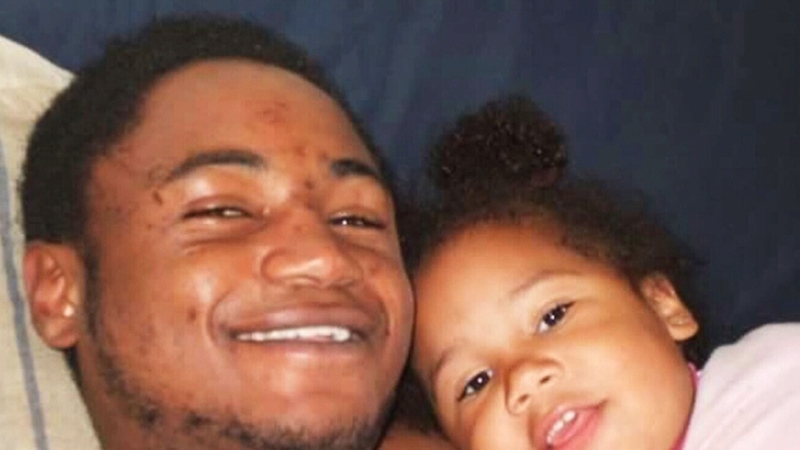 Olando Brown is seen with his daughter in this file image.